In August 2018, the sandstone aggregate processing line designed and supplied by Luoyang Dahua Heavy Industry Science &Technology Co., Ltd. began trial operation at the SK Hydropower Station in Pakistan. This project is sand and stone wastewater treatment system for SK hydropower station. The whole production line is designed and supplied by Luoyang Dahua. The production capacity is 90 t/h. It adopts the new processing technology of “fine sand recovery device + deep cone thickener mold block + chamber filter press”, with a total water volume of 120 m³ /h and a mud volume of 6.93 t/h. 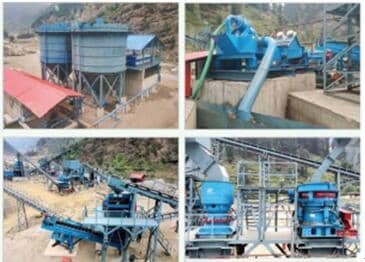 The equipments are included Jaw crusher, single cylinder cone crusher, multi-cylinder cone crusher, sand making machine, container electronic control and sewage treatment system. In the process of sand and stone system processing, high concentration of suspended solids will be generated to wash and screen waste water. If not treated and discharged directly, it will seriously pollute the water quality of the river in the operation stage, resulting in turbidity of the river, silting of river bottom mud and destroying the water ecological balance. Traditional water treatment methods include horizontal flow sedimentation tank, radial flow sedimentation tank, inclined pipe sedimentation tank, etc., which have low removal rate if suspended matter, large area, frequent and heavy work load of mud cleaning, and easy failure of mud scraper. This system improves the traditional sand and stone wastewater treatment process, reduces the area, increases the removal rate of suspended matter, saves the power consumption, reduces the maintenance cost, and facilitates the management. It realizes the recovery and reuse of sand and stone wastewater, and meets the environment protection requirements of “zero discharge” of wastewater.